President Trump has long been the target of the ire of late-night comedians, even prior to his fateful Presidential campaign. In one such episode, during the 2011 White House Correspondents Dinner, Trump received an especially bad lashing from late night comedian Seth Meyers. “Donald Trump has been saying that he would run for President as a Republican,” Seth Meyers said during the stand-up set. “Which is surprising since I just assumed he was running as a joke,” he said to stone-faced business mogul. 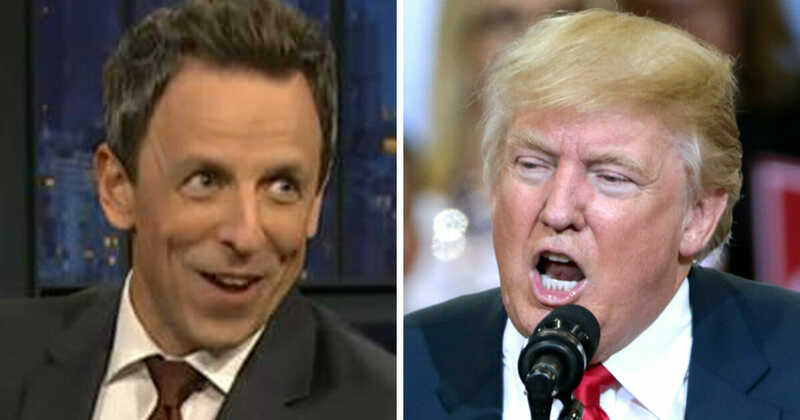 Later, when Meyers was announced as the host of the Emmy’s in 2014 he Trump Tweeted: “That Seth Meyers is hosting the Emmy Awards is a total joke. He is very awkward with almost no talent. Marbles in his mouth!” Clearly, Trump has long held some resentment toward the late-night comedian. The bad blood between the two of them was further cemented by the comments Meyers made regarding the conditions Trump wanted in order to appear on his late-night show. According to Meyers, Trump claimed that he would only appear on the show if Meyers first issued an apology for his comments. The request was supposedly relayed to Meyers through Trump’s attorney Michael Cohen. Meyers turned down the request for an apology. Trump recently expressed his disapproval for comedian Michelle Wolfe’s performance at the White House Correspondents Dinner this year. “Everyone is talking about the fact that the White House Correspondents Dinner was a very big, boring bust…the so-called comedian really ‘bombed,’” he Tweeted. Trump has not attended the Dinner during his presidency.